"Authors are as much creatures of the reader's imagination as the characters in their books." The first half of the book is very character focused and Rowling is great at building characters. You get easily attached to them and halfway through the book, you feel like you know them. The plot moves slowly but that doesn't mean that the first half of the book is devoid of action. There are a lot of back-stories and memories and sub-plots to keep you involved and curious. The book is impressive and moving from the very beginning. I loved the way Rowling deals with hard emotions and gory details in brisk, matter-of-fact tones and the intended message is sent across subtly, even employing dark humour, quite unlike the bold life lessons in Harry Potter. The build-up is great, you just know something big is coming, and when it does, it arrives with a BANG! Rowling has written outrageous stuff for the sake of making the book "different." She has tried too hard to sound adult. There is too much cursing and bad language and I lost respect for Rowling. After reading every single thing that Rowling had ever written about the Wizarding World and re-reading most of it over the years, her writing felt homey and comfortable and somewhere I felt I had a connection with her, which I am sure most people who grew up with the Harry Potter series feel. But then, like Her Majesty feels in The Uncommon Reader, we don't really know an author just by reading their book. What J. K. Rowling shows us through Harry Potter is just one side of her. And so, even though the author of Harry Potter is someone that we love and is more than enough for us, J. K. Rowling doesn't end there. 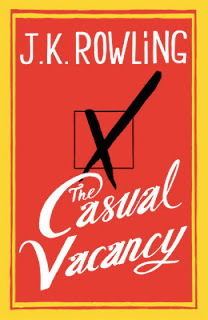 She is full of surprises and The Casual Vacancy proves that. I'm currently about 2/3 of the way through this novel also, and I agree with your thoughts so far. Solid characters, good writing. But for me at least, it is slow reading. Oh, I know, it's quite slow, that didn't make it dull for me. Would like to know what you think once you're done with the whole book! Thanks for stopping by! Waiting to read a review of 'The Casual Vacancy' after you are done with the book.